Over time, an artist’s personal collection of work can become astonishing and overwhelming. Sometimes, it needs to find a good home. Susan Lehman has decided its time to move some inventory from her house to your house. Lehman is one of the most prolific painters and best-known artists on the Oregon Coast. “From the Annex: The Retrospect Paintings of Susan Lehman” now showing at Pacific Park Gallery features dozens of paintings created in a dozen years by the Bandon artist. A reception at Pacific Park Gallery, 1957 Thompson Rd., in Coos Bay celebrating Lehman’s Oregon career is Saturday, May 13, 3-6 p.m. Many of the paintings and collages have never been exhibited. All but a few are for sale on a make-an-offer basis—unheard of. Once again Lehman is setting the pace for coastal artists. To be able to have a retrospective solo show an artist must do as Picasso advised: “Paint, paint, paint.” The advice is something that has guided Lehman daily and something she suggests for anyone beginning a career as an artist. She works every morning in her studio. By first studying watercolor locally with Louanne Elke, and then by adding her own layering collage elements, Lehman has developed her signature style. She is recognized as a successful artist and has shown up and down the West Coast, as well as in international online exhibits. Her exhibition schedule is part of what drives her to continue to put in her brush miles. This exhibit offers the unique opportunity to view works in the series as they were created: Tsunami, Forests, Fauna, Lost and Found, Death and Destruction, Mountains, Jazz, and Waterways. Her evolution as an artist is evident as is her determination to continue to study and improve. Always a student of her craft, Lehman has worked in black and white to help her find and strengthen her compositions, she says. She studied traditional art at California College of the Arts in the San Francisco Bay Area and taught art in Sacramento. Lehman retired to Southern Oregon Coast in 2003. “An artist’s definition of what it means to be a “successful artist” changes over time,“ she said. 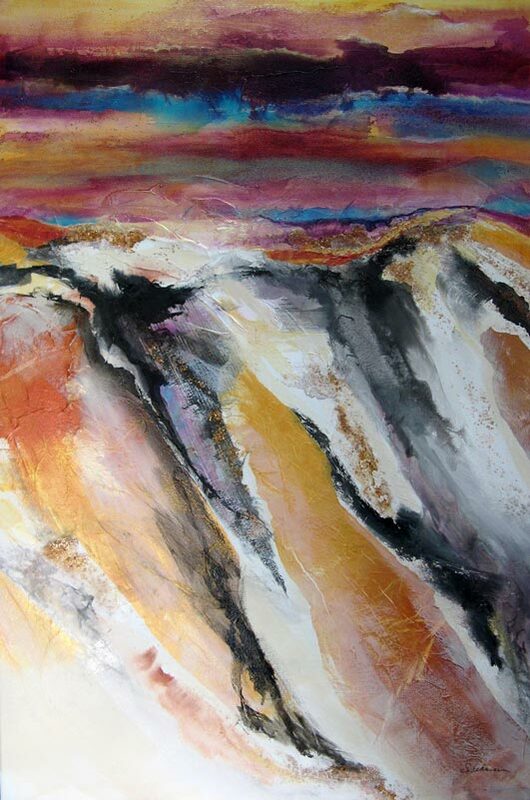 She is currently represented by Second Street Gallery in Bandon. The public is welcome to meet the artist and enjoy music by Mark Tierney at the reception May 13. The exhibit will hang through July. Pacific Park Gallery is open Monday through Friday during regular business hours. Pacific Park Gallery is a not-for-profit, non-commission sales and exhibit space created by artists for artists.